I have always argued that without Mr. Clergue there would be no Wawa, and without Clergue and Wawa there would be no Sault Ste. Marie! It takes vision to see the possibilities and it takes a convincing visionary to make them happen. Although Clergue's questionable administrative skills were his downfall, he got the ball rolling and Sault Ste. Marie and Northern Algoma have not looked back since. From Clergue's Heritage Door you can see the gaping open pit atop the highest mountain looming north of Wawa Lake. 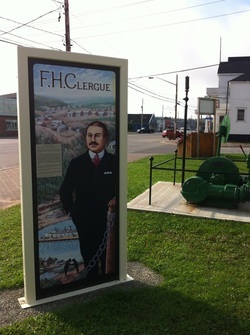 That mountain of iron gave birth to Clergue's industrial empire which is his true legacy to the people of Algoma.